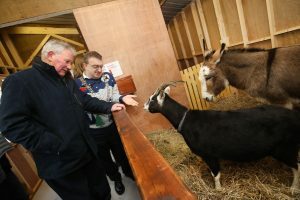 The Live Animal Crib was officially opened at the Mansion House in Dublin on Monday last. 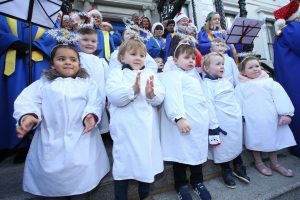 Angels from St Joseph’s Nursery, and members of the Lucan Gospel Choir struck the right note as Irish Farmers Association (IFA) Deputy President Richard Kennedy and Lord Mayor of Dublin Mícheál MacDonncha declared the crib open to the public. The IFA provides the animals and their care at the crib and all donations go to the Mayor’s charity which helps the poor of Dublin. John Gallagher and Paul Finn look after the animals at the crib. They take them to the city centre each morning and back home to the farm near Enniskerry each evening to ensure they are well cared for. This year they have to negotiate the newly opened Luas tram lines with the donkey, goat and sheep. However it is a mixed blessing as now that the Luas is open, more visitors are expected to attend this small piece of the countryside in the heart of the city. One of the farmers, who has provided animals for 20 years, said he loves seeing the joy on visitors’ faces when they encounter animals such as the donkey and goat constantly interacting with each other. Children can enjoy patting the live animals and experiencing for the first time something like touching a sheep’s woolly coat. The Crib is constructed by Dublin City Council’s Housing Maintenance Section and is a life size stable. This joint venture between Dublin City Council and the IFA which began in 1995, is free to the public but any voluntary contributions from the public will go towards the Mansion House Fuel Fund. The fund was set up by Sir John Arnott in 1891. It originally assisted the needy during a particularly hard winter. At the end of that winter the surplus was carried over to the next year and the Mansion House Fuel Fund has continued to aid the needy in Dublin ever since. It is one of the oldest charities in Dublin. Nowadays the Mansion House Fuel Fund distributes cash grants through a number of Charitable Societies, without any distinction of creed. Charities who have benefitted in recent years include the St. Vincent de Paul Society, Dublin Simon Community and Abbey Presbyterian Church Hamper Fund. All donations go to those in need. In previous years the Christmas Crib has raised up to €20,000. Separately the IFA has urged Irish people to “check twice” to make sure the food they buy this Christmas is really Irish, and support their own. Launching the IFA’s Fairness for Farmers, Honesty for Consumers Christmas Campaign, Joe Healy said, “Consumers value Irish produced food and want to support Irish farmers. Retailers know this and they exploit consumers’ good intentions by using misleading labelling and unsustainable discounting to lure customers.” Joe Healy urged retailers not to mislead and confuse their customers by mislabelling. The Live Animal Crib is open to the public from Monday 11th December until Christmas Eve from 11am to 5pm daily (Christmas Eve 11am to 1pm).